Argos sent a toy droid into space recently, footage has just been received at Toyology Towers and, yes, here it is. The point was to celebrate their new Last Jedi toy range so we’re scratching our heads as to why it wasn’t BB-9E that took the trip, but anyway. 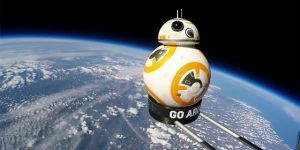 The BB8 completed the mission in hours, reached a speed of over 200 miles per hour, got up to a gliding altitude of 37,260m above Earth – It took a team of 12 space experts an entire month to prepare the toy for lift off. Fess up then Dan, what information did BB-8 reveal? Marvel Legends Series Mjolnir – Be it Thor worthy?